How to Book Chateau Bottle Service at Chateau Nightclub? 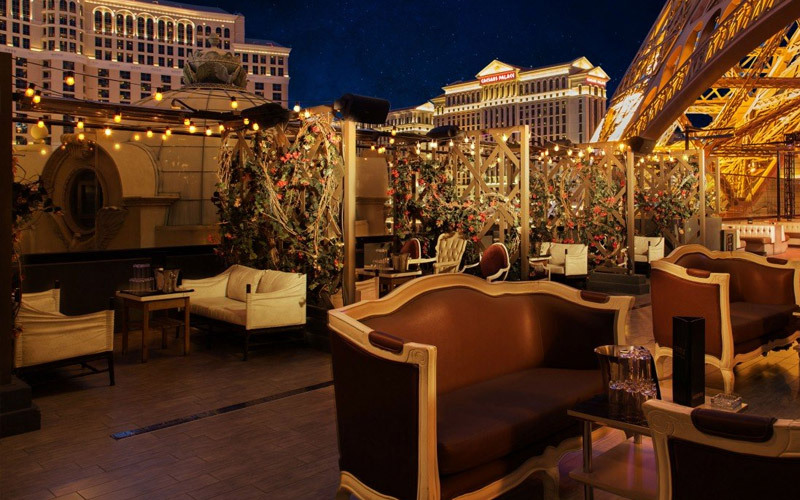 Trying to secure Chateau bottle service at Chateau Nightclub in Las Vegas NV at Paris Hotel with a reliable company that will secure your reservation with the venue worry free upon your arrival? 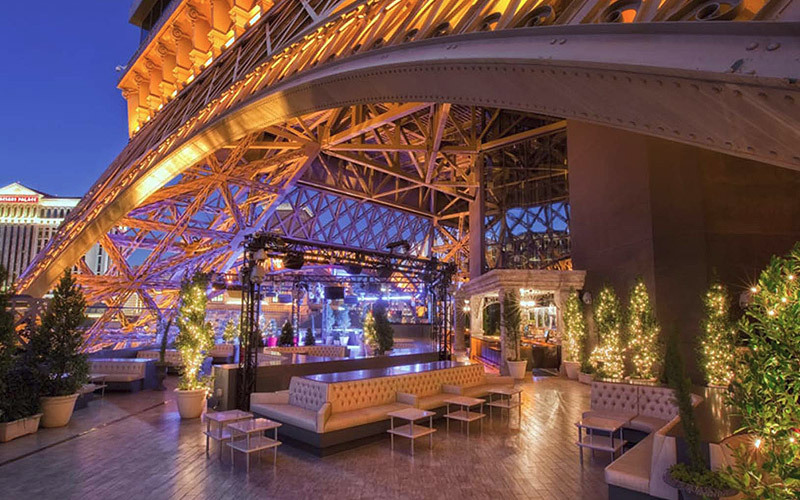 Las Vegas Nightclubs would like to handle all of your nightlife needs at this 37,000 square foot venue. There are 104 VIP Table locations throughout the venue, with 31 tables in Main Room of the nightclub that include 7 Red, 3 Blue, 10 Orange, and 2 Purple tables, and 73 tables on the Roof Top Garden and Deck that include 29 Red, 6 Blue, 10 Orange, 2 Purple, 11 Green, and 2 Yellow tables. If you are wondering how to book Chateau bottle service at Chateau Nightclub in the Paris Hotel, you have come to the right host agency. The pricing of the table minimums fluctuate slightly where you can expect an increase of during holidays and special events. The pricing of the minimums are pretty consistent since the venue does not bring in big headliner DJs on weekends and week days. How much are tables for Chateau bottle service at Chateau Nightclub? Tables are $500 to $3,000 depending on the real-estate. 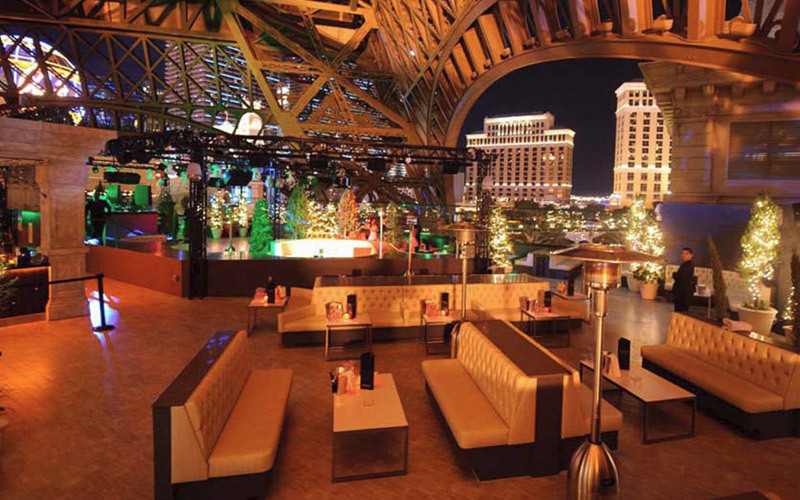 The Rooftop is considered the prime real estate where the minimums can be slightly more expensive than the minimums in the Main Room of the nightclub. How much are Main Room Red tables for Chateau bottle service at Chateau Nightclub? Main Room Red tables have 7 locations that are estimated to cost $500 on regular nights and weekends. During holidays and special events, expect the minimum to cost $750. Pricing is based on up to 5 people in your group. How much are Main Room Blue tables for Chateau bottle service at Chateau Nightclub? Main Room Blue tables have 3 locations that are estimated to cost $1,000 on regular nights and weekends. During holidays and special events, expect the minimum to cost $1,250. Pricing is based on up to 6 people in your group. How much are Main Room Orange tables for Chateau bottle service at Chateau Nightclub? Main Room Orange tables have 10 locations that are estimated to cost $1,250 on regular nights and weekends. During holidays and special events, expect the minimum to cost $1,500. Pricing is based on up to 8 people in your group. How much are Main Room Purple tables for Chateau bottle service at Chateau Nightclub? Main Room Purple tables have 2 locations that are estimated to cost $1,500 on regular nights and weekends. During holidays and special events, expect the minimum to cost $2,000. Pricing is based on up to 8 people in your group. Rooftop Red tables have 29 locations that are estimated to cost $500 on regular nights and weekends. During holidays and special events, expect the minimum to cost $750. Pricing is based on up to 5 people in your group. How much are Roof Top Blue tables for Chateau bottle service at Chateau Nightclub? Roof Top Blue tables have 6 locations that are estimated to cost $1,000 on regular nights and weekends. During holidays and special events, expect the minimum to cost $1,250. Pricing is based on up to 6 people in your group. How much are Roof Top Orange tables for Chateau bottle service at Chateau Nightclub? Roof Top Orange tables have 6 locations that are estimated to cost $1,250 on regular nights and weekends. During holidays and special events, expect the minimum to cost $1,500. Pricing is based on up to 8 people in your group. How much are Roof Top Purple tables for Chateau bottle service at Chateau Nightclub? Roof Top Purple tables have 2 locations that are estimated to cost $1,500 on regular nights and weekends. During holidays and special events, expect the minimum to cost $2,000. Pricing is based on up to 8 people in your group. How much are Roof Top Green tables for Chateau bottle service at Chateau Nightclub? Roof Top Green tables have 11 locations that are estimated to cost $2,000 on regular nights and weekends. During holidays and special events, expect the minimum to cost $2,500. Pricing is based on up to 8 people in your group. How much are Roof Top Yellow tables for Chateau bottle service at Chateau Nightclub? Roof Top Yellow tables have 2 locations that are estimated to cost $2,500 on regular nights and weekends. During holidays and special events, expect the minimum to cost $3,000. Pricing is based on up to 10 people in your group. How much are bottles of Liquor with Chateau bottle service at Chateau Nightclub? Liquor is $425 to $6,000 for per bottle or 750ML to 1.75 Liter sizes. Magnum Vodka is $750 to $800 for 1.75 Liters by Blevedere, Ciroc, Grey Goose, and Stolio Elit. Regular Size Vodka is $425 to $500 for 1 Liter by Tito’s, Stoli, Belvedere, Ciroc, Grey Goose, Stoli Elit, and Ketel One. Whiskey is $350 to $900 for 1 Liter Jameson, Fireball, Crown Royal, Macallan 12, and Johnnie Walker labels. Bourbon is $450 for 1 Liter by Jack Daniel’s, and Makers Mark. Gin is $425 to $500 for 1 Liter by Tanqueray and Bombay Sapphire. Rum is $375 to $450 for 1 Liter by Mailbu, Bacardi, and Captain Morgan. Magnum size Tequila is $750 to $1,750 for 1.75 Liters by Patron labels. Regular size Tequila is $450 to $1,200 for 750ML by Patron, Don Julio, and Herradura Seleccion labels. Brandy is $425 to $900 for 750ML by Hennessy labels, and Cognac is $6000 for 750ML by Remy Louis XIII. How much are bottles of Champagne with Chateau bottle service at Chateau Nightclub? Champagne is $425 to $25,000 per bottle for 750ML to 12 Liter sizes. Large Format Champagne is $2,500 to $25,000 for 1.5 Liters to 12 Liter sizes by Veuve Cliquot, Perrier Jouet, Moet & Chandon, Dom Perignon, Louis Roederer, and Armand de Brignac. Regular Size Champagne is $425 to $4,000 for 750ML by Luc Belaire, Moet & Chandon, Dom Perignon, and Armand de Brignac. 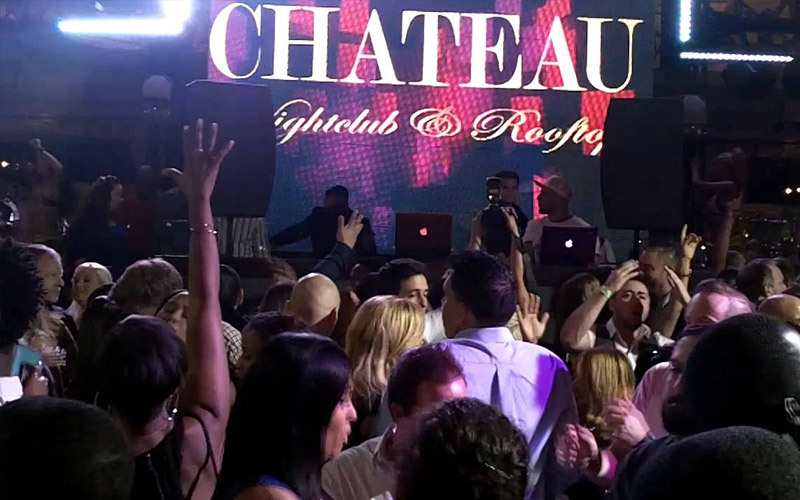 What types of mixers are included with Chateau bottle service at Chateau Nightclub? Your reservation will entitle your table to standard mixers of your choice. You can choose from Coke, Sprite, Tonic, or Club Soda. You can also order Pineapple, Orange, or Cranberry juice. If you would like to compliment your bottle with a Beer Bucket of (6) you can choose Heineken, Stella, Corona, or Coors Light for $50. You can order 6 Pack of Regular, or Sugar Free Red Bull for $48, and 6 pack of bottled water for $42. Well Cocktail Carafes are $85 and Premium Cocktail Carafes are $100. How much are drink prices with Chateau bottle service at Chateau Nightclub? Drinks prices are Shots for $10, mixed Drinks for $12 to $15, Beers for $8, and Mix Drinks are $15 to $20. You can order drinks from your cocktail waitress anytime which we suggest you do to help her out. What happens after I book Chateau bottle service at Chateau Nightclub? After you book your reservation through our company, our clients will receive an email confirmation with the details of their reservation, as well as instruction to follow to meet up with our host when you arrive. Once you meet up with our host you will be escorted into the venue to your table where you will be introduced to your lovely cocktail waitress for the evening. You will be given a menu, and then you can decide if you would like to pay with cash or credit. 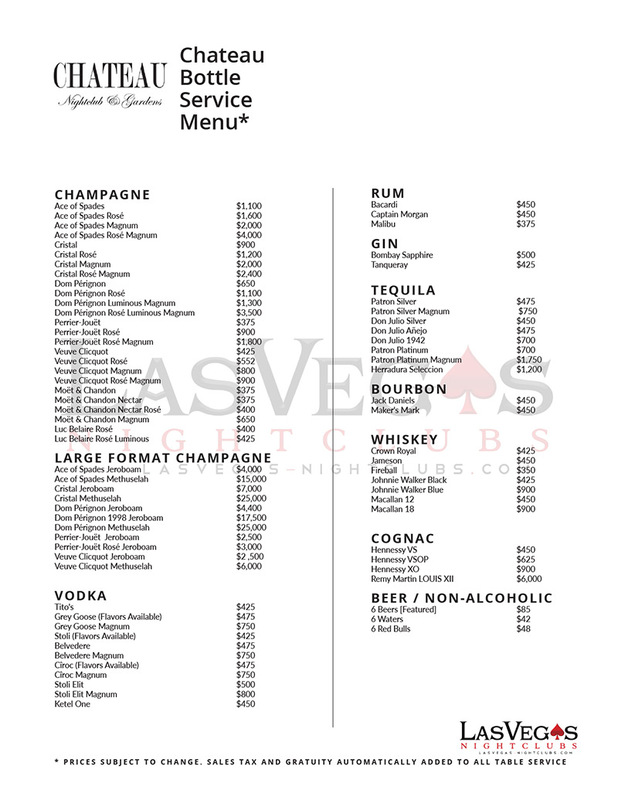 How much are taxes and gratuities with Chateau bottle service at Chateau Nightclub? All reservations have an 8.1% state sales tax, 22% gratuity, plus a 5% venue and resort fee. Learn about the Chateau guestlist. 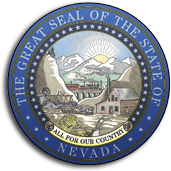 Learn more about Chateau Nightclub Las Vegas.